A „Peace Politician“ died at the age of 93. „De mortuis nil nisi bene“ is commonly translated in English with „Speak no ill of the dead“. The headlines of German obituaries on Shimon Peres outbid themselves in adulation. President Obama, however, outbid even the Germans. He praised Peres without irony as „a champion of peace. […] As Americans, we are indebted to him”, he said. He even got metaphysical: „A light has gone out, but the hope he gave us will burn forever.“ The US president should have really known better, that even “Peace Angel” Peres was only interested in peace with the Palestinians on Israeli conditions, namely, their subjugation under an Israeli peace diktat. Obama’s hypocrisy was topped off by Israel’s Prime Minister Benyamin Netanyahu, who had fought fiercely against the „peace policy“ of Yitzhak Rabin and Shimon Peres. Two Germans, former Germany’s President Christian Wulff and Charlotte Knobloch, former President of the Central Council of Jewry in Germany, outbid even the general adulation of Peres. Christian Wulff wrote: „[Peres] outshone his time, with his empathy, his great heart, his philanthropy and his courage, his apparently unshakeable belief that Good is possible. Shimon Peres has shown what the world so desperately needs and what it simultaneously so sorely lacks.“ Ms. Knobloch said: „He was a symbol of the Zionist dream”, undoubtedly believing that she was thereby praising the deceased. This “dream” had however turned out to be a nightmare for the Palestinians. Peres’ entire political life was, according to her, a „struggle for peace“. Was he really a „smart bearer of hope, a tireless reconciler“? It seems that such delusions characterize the public image of a politician, the reality of which he had created on the ground had nothing, absolutely nothing, to do with such eulogies. I need not dwell here upon the assessments of the official political class, as they are drafted in the same vein. Peres‘ career is well known to everybody: He drew his nimbus as a confidant of David Ben-Gurion; he was the main initiator of the Israeli nuclear program, friend of German CSU leader Franz Josef Strauss; he spent two stints as Israel’s Prime Minister; he held almost every government post, crowning his long career as „President of the State of Israel“. He was not elected to this function by the population but by the Israeli parliament, the Knesset. In each election, Peres always came out second. He was nicknamed by the public the „eternal loser“. An important reason for that is that Israelis deeply distrusted him. Without much ado, it can be said that he has served the Zionist entity until the last breath. This is not be equated with the cause of peace with the Palestinians. His image in the West has always been that of a „liberal“ or a „good Israeli“. Less known is the fact, that Peres was a Zionist hardliner who managed to garb his ideas in the rhetoric of the so-called „Zionist Left“. His vision was not different than that of Ariel Sharon or Netanyahu, but he knew how to present it in a less confrontational manner, designed for a Western audience. On this point, the contrived visions of Peres resemble political obituaries of political leaders in the US and Germany. In Peres’ various political positions, he always supported the colonization of the occupied territories. After his „partner in peace“, Premier Minister Yitzhak Rabin, was assassinated in November 1995 by Yigal Amir, a Jewish right-wing extremist, Peres followed Rabin in the Premiership. Peres had never served in the Israeli military, hence, in the May’s election of 1996, opposing Netanyahu, he tried to make a showing of a „strong“ leader by, inter alia, authorizing Operation “Grapes of Wrath” against the Hezbollah movement in Lebanon. In that operation, Israel’s army bombed the UN base at Qana. In this attack, 106 Lebanese were killed and an equal number was injured. As usual, the Peres government “regretted” the massacre. Despite playing the strongman, Peres lost the elections for Netanyahu. Ten years earlier, in 1985, Peres as the then serving Prime Minister of Israel, was responsible for an act of aggression against Tunisia that killed 75 Tunisians and Palestinians. According to international law, Israel’s aggression violated „the sovereignty, territorial integrity or political independence of another State, or (was) in any other manner inconsistent with the Charter of the United Nations“, wrote Elias Davidsson, a native of Palestine, as far back as 1993. As there existed no international enforcement mechanism at the time, which would allow “the arrest, trial, and punishment of criminals such as Mr. Peres”, Davidsson urged “authorities of civilized nations to refuse any official dealings with persons for which there is prima facie evidence of implication in such crimes”, including Shimon Peres. 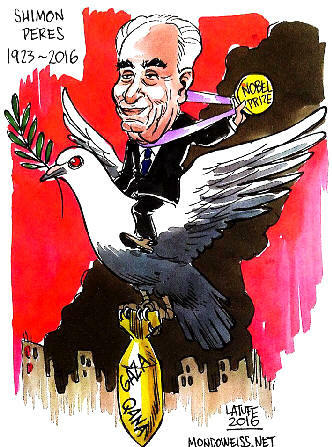 Shimon Peres received together with Yitzhak Rabin and Yasser Arafat the Nobel Peace Prize for the so-called Oslo peace process, which brought only havoc and desperation upon the Palestinian people. It’s not unusual in our world that former terrorists such as Menachem Begin or war criminals such as Henry Kissinger will be bestowed with this distinction. Immediately after taking office, Barack Obama was awarded the Nobel Peace Prize, i.e. before he reneged on his promise to close Guantánamo and started extra-judicial executions around the world. In obituaries, only good and beautiful things are written about the deceased. May mine only serve to complete the picture of a man who authentically personified Zionism. First published here, here, here and here. Dieser Beitrag wurde unter Israel/Palästina abgelegt am September 29, 2016 von Ludwig Watzal.